Focalizers are priestesses who are the ONLY ones who have been personally ordained by Ariel Spilsbury and certified by the Sanctuary of the Open Heart to carry on Ariel’s 13 Moon Mystery School work directly. 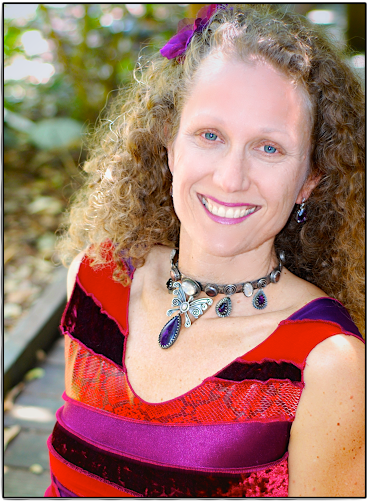 Elana Auerbach is a heart centered and gifted spiritual guide. Her own journey of remembrance and embodiment informs her work with others. Having spent her young adulthood getting a degree in Mathematics, as a management consultant, and as a banker on Wall Street, Elana knows intimately what it is to be in a place of soul disconnection (or as she puts it, “on the conveyor belt of life”) and then, to wake up and discover a path of ecstatic and embodied service. Elana has been leading circles for over 14 years and has been mentoring with Ariel Spilsbury for more than 12 years. Elana is a Hebrew Priestess, practicing earth based Judaism, as well as a dedicated student of Zen. Elana weaves these three spiritual traditions into a beautiful tapestry that illuminates her work and guides her moment by moment awakening. As a 13 Moon focalizer, Elana wields the sword of truth with compassion and clarity. Elana brings body based practices to the expanded awareness experience in circle, to support initiates in truly embodying, in their own unique way, the 13 Moon Archetypes. She also brings a strong focus on cultivating lineage gifts and engaging in daily practices so the awareness and insight you have in circle, permeate the rest of your life. 1) Life Transition Ceremonies including Officiating Weddings (including the Inner Marriage), Rites of Passage ~ Menarche, Pre~Birth Ceremony (for a Child or another Creation), Baby Blessing, etc. 2) Mediation Initiation ~ Elana creates a sacred container where conflict and separation become an occasion for awakening and intimacy. Combining her mediation & Initiator skills, Elana weaves an opportunity for resolution, heart opening and growth between you and your partner, family member, colleague, or whomever you may be in struggle and strife with. 3) Soul Mentoring ~ Sitting heart~to~heart to excavate the unconscious & the unknown to glean guidance & wisdom. Elana is the Initiator Temple Keeper for the Sanctuary of the Open Heart. She also devotedly tends the flame of the Berkeley Yurt temple, where she lives with her loverman and son. You can reach Elana at elanarobyn@gmail.com. Elayne Kalila Doughty, MA, MFT, has been on a path of passionate service for the past twenty years, inspiring women around the world to unleash their heart gifts and step into their full potential. She specializes in helping women tap into their deepest wisdom, enabling them to harness their own transformational power to be more effective and whole in every aspect of their lives. She is a psychotherapist, spiritual activist, best-selling author, speaker, soul midwife, and ordained Priestess and Focalizer of the 13 Moon Mystery School lineage. Elayne is the Founder of the Priestess Presence Temple — Powerful Women Changing the World (www.Priestesspresence.com) This is dedicated temple of the 13 Moon™ Mystery School where she offers a variety of in depth Mystery School trainings for women who are called to ground in real practice, devoted embodiment, and service in the world. Elayne is passionate about opening the ancient mysteries of the Divine Feminine into our very modern-day lives so women can all step more fully into serving from a place of love, presence and purpose. Elayne is a co-founder and Vice President of The Global Gratitude Alliance (www.gratitudealliance.com) which has a mission to empower and improve the lives of women, children and young adults through grassroots projects in some of the most vulnerable parts of the world. Her work at the Gratitude Alliance led her to create The Safe Embrace Trauma Healing Program (www.safeembracetraumahealing.org) which is the culmination of many years of work with survivors of trauma and gender based violence. This program promotes trauma healing and empowerment for women, men, girls and boys across the globe. It is an innovative program that focuses on creating an environment of unconditional love, whilst accessing Joy, Play, and Compassion as the foundation for healing. She also founded the Compassionate Activism Trauma Healing Training – (http://www.safeembracetraumahealing.org/foundation-level) providing training for those who are called to bring healing and activism together in global service projects. Sarah Uma is a Planetary Priestess here to support the awakening of the Divine Feminine. She is an ordained Priestess of the 13 Moon Mystery School and is a focalizer and Temple Keeper as the Alchemical Goddess of Ecstasy. She is currently offering a year long initiation through the Planetary Priestess Virtual 13 Moon Mystery School. As an intuitive counselor her intention is to support you in embodying your full expression of the Divine, to nurture you in being the God/dess you intrinsically are, and to offer you a direct experience of all wisdom being within you. She has mentored closely with Ariel Splisbury for the past 14 yrs. and has been a devoted Priestess offering global water blessings, women’s circles, archetypal reading, archetypal mentoring and hosting retreats empowering women to step into there sovereignty, and to move beyond lack and limitation into luminosity and prosperity. She is the Mother of two amazing beings and a new Grandmother to her first grandson. This path of the 13 Moon Mystery School is about being an embodiment of the Great Mothers love in her many faces and forms. To be a living temple illuminating the altar of the One Heart shining bright, to be a guide home to the heart. Blessed Be….It is done in the name of the One! Eden Amadora is an ordained priestess and focalizer for the 13 Moon Mystery School. As an archetypal voice & embodiment coach, ceremonial singer, and prayer-formance artist with over 20 years of shamanic and yogic training, her work is in service to the awakening of the collective heart of humanity. She is passionate about creating and holding sacred space for women to have an embodied experience of working with the archetypes of the Divine Feminine. It is her joy to witness the transformation that happens when they are supported to embody their most essential, radiant selves and express their authentic voices. Eden is gifted at holding unconditionally loving space and simultaneously being a fierce voice of truth. She is the temple keeper of the Primal Goddess Temple in the Sanctuary of the Open Heart. Her empathic, instinctual nature brings her to sharing what she is perceiving through body wisdom. She holds the sword of the initiator and is not afraid to bring to awareness, the ways in which beings are presently unconsciously limiting their expression and spiritual growth. Eden is a conduit for soul guidance, as she supports and mirrors her initiates. She lives with one foot in the archetypal realm, holding others in their highest essence helping them to transmute their shadow – or stuck old patterns – into more self-love and empowered presence, allowing them the freedom to fully live their unique mythic story. Eden Amadora offers ceremonial circles, retreats, devotional temple days, and 1:1 sessions for women who are ready to rest into a more self-trusting place, awaken to their true beauty and embodied self-love, align with their soul purpose, and live into greater joy and connection to their essence, Source and sisterhood. Rev. Dr. Devaa is a soul midwife, spiritual teacher and business leader. She is a co-founder of The Shift Network and Founder ofInspiring Women with Soul — a unique online gathering of more than 100,000 women from more than 160 countries.Devaa offers deeply experiential and transformative work, through coaching, mentorship, courses, workshops and retreats. Prior to Shift Network, Devaa was the founding Executive Director of the Full Circle Fund, dedicated to building a new generation of civic leaders. She was also the Director of Member Engagement at the Institute of Noetic Sciences (IONS), an organization bridging science and spirituality. Devaa also worked as a consultant at the Boston Consulting Group where she offered management advice to Fortune 500 Companies. Devaa is a Fulbright Scholar with both undergraduate and graduate degrees from Stanford University and a Doctorate in Ministry from Wisdom University. Devaa is also an interfaith minister and a Priestess and “Focalizer” of the 13 Moon Mystery School. Devaa is a passionate believer in activism and service. She’s the volunteer Music Director at the San Quentin Prison’s Parallel Play Project, an avid volunteer for a number of international service projects including the distribution of water filters in rural areas of India, trained domestic abuse counselors in art therapy in Ecuador, and facilitated a healing program to staff members at an orphanage for HIV positive youth in Ethiopia – among others! In her spare time, you can often find Devaa making music! Her songs fuse East and West with groovy, danceable grooves. Her debut album, Sacred Alchemy, aims to reawaken and liberate the many dimensions of the sacred feminine. Let’s remember ourselves through archetypal play and embody our spiritual magnificence. We use the mermaid archetype to discover and nurture our mythic gifts so we can share them with the world. As a water priestess, Mermaid Vyana offers a range of services including: aquatic healing sessions, sacred bathing/anointing with holy oils, as well as mermaid retreats and direct experiences in Kealakekua, Kona. Hawaii (Big Island). Aside from years of experience with the 13 Moon Mystery School (Ariel Spilsbury), she is also trained in the sacred art of anointing with Holy oils (Emerald Temple by Diana Dubrow), Watsu level II demonstrated mastery and basic Healing Dance (Harbin School of Healing Arts), and apprenticing with Aquamystica (Jumana King Harris, Ashland,Oregon). www.MermaidVyana.com and www.MermaidDreams.com or www.KonaBedandBreakfast.com. You can reach her at heather@heatherreynolds.com. Natalia Price in an ordained priestess and focalizer for the 13 Moon Mystery School. She has been involved with this lineage and her mentor Ariel Splisbury for 13 years. She facilitates women’s circles, retreats and online programs to support and inspire women in embodying their unique expression of the Divine and re-membering the gifts they came here to offer, while authentically embracing shadow and accessing the stillness within. She is a temple keeper for the Sanctuary of the Open heart and holds the temple pillar of the Queen of death. Drawing inspiration from her experiences as a performance artist…..specializing in sacred dance, circus arts, and ritual theatre….she invites expressive arts and mythic embodiment as a vessel for personal and community transformation. As a certified yoga instructor and student, her passion for conscious movement and breath touch every aspect of her life and offerings. Natalia’s priestess path has led her traveling the world to ancient temples and sacred power sites offering the beauty way of devotion and service as a living prayer to re-balancing Mother Gaia and honoring the divine Feminine. Natalia is currently focalizing a year long priestess initiate circle in Grass Valley, CA. Where she lives as mother and wife.